I recently showed J tally marks and he was instantly interested in learning more. Thankfully, J is already a skip counting pro (even by obscure numbers like 12 - and yes, he's only five! ), so the concept of tally marks was quickly understood by him. 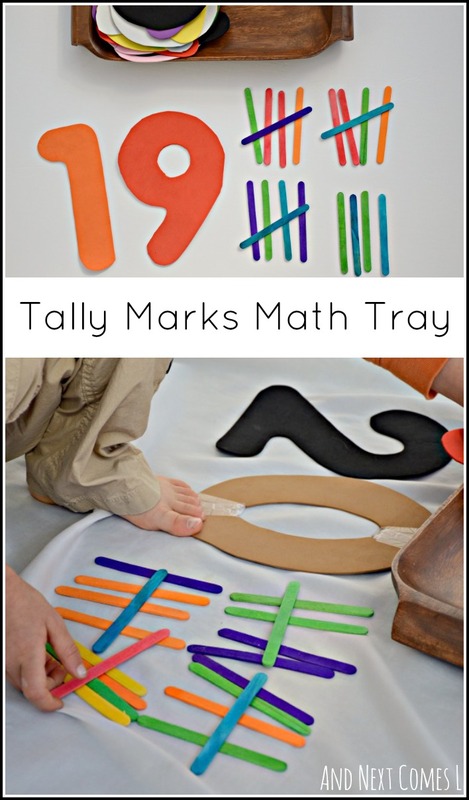 To reinforce his learning, I set up this super simple tally marks math tray. It was also a great preschool math tray for K to practice his counting. For this math tray, we used our giant homemade foam numbers and colored craft sticks. You could substitute any kind of number manipulatives that you have on hand. J is just particularly fond of these foam numbers, as I have mentioned before here, so I like to use them as much as we can for math activities. The idea was for J to pick a number and count up to the number using tally marks, like below. J has been exposed to tally marks in a variety of ways, including reading about them in this cute picture book called Tally O'Malley. So he started tallying with small numbers like 17 and 20. J also did large numbers. Thankfully, not too large since he would have run out of craft sticks. Here he is making tally marks for the number 40. Then J made sure to practice skip counting by fives to double check that he counted correctly, which, of course, he did. K also joined in on this math tray, as I noted earlier. Obviously, he doesn't understand the concept of tally marks, nor should he at age 3, but I was happy to see him count out the correct number of craft sticks anyway.